Another lovely post from your dataset! The supply curve isn't so elastic that readers will read an unlimited amount of content at lower prices. A reader's time is limited, and the reader values their time, so it would make sense the reader is willing to invest good money if they know it's for a quality read. The possible lesson here, and it's a bright note for authors with the ability to develop high quality content, is that readers will pay for your content if it's worth paying for. I wonder, if free alone isn't enough to get readers to invest their precious time, will we ever see the day when publishers pay readers to sample their stuff? I suppose it's already happening. Publishers pay marketing expenses to reach readers, why not pay readers direct? But then who pays the publisher to get the stuff to the author? It flips the model almost entirely, authors would end up paying for publication in ways that in the past would have been seen as vanity! I'd like to see the graph as strictly units sold in each price range, rather than revenue generated by those sales. I think you mean the demand curve isn't so elastic, right? You're talking about e-book consumers. An interesting question, what is the supply curve of an e-book or any virtual good with no marginal cost? Anyway, good post. For what it's worth, here's an update on demand for various formats. I uploaded a free public-domain eBook a few days ago, to a popular site, Feedbooks. 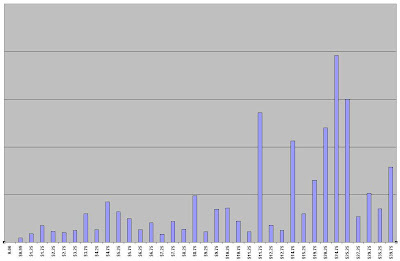 So far, the distribution of eBook formats in the first 178 downloads as of Dec 25, 2012, has been: ePub 89%, PDF 6%, Kindle 4%. The downloading clients have been Aldiko (for Android) 30%, Windows 17%, Android 7%, FBreader 10%, Mac 4%, Linux 3%, Stanza 2%, and various others for the rest. and various others for the remainder. Here is the link to the book: http://www.feedbooks.com/book/6497/with-her-in-ourland .